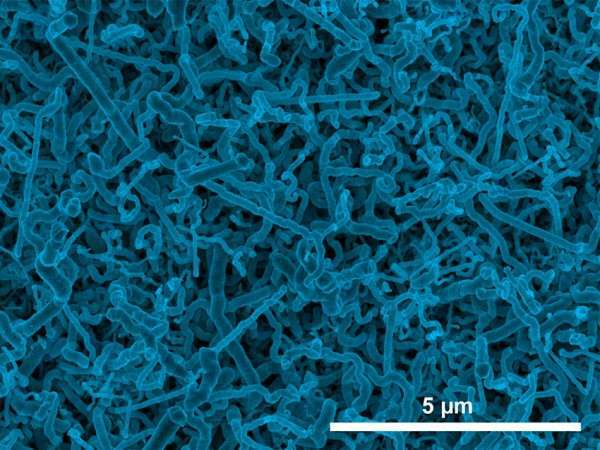 For the first time, germanium nanowires have been deposited on indium tin oxide substrate by a simple, one-step process called electrodeposition. The germanium nanowires produced by this method have superior electronic properties compared to silicon and can be used as high-capacity anode material for lithium-ion batteries, but the nanowires were previously too expensive and difficult to produce. This process may resolve the cost issue to advance this battery technology. Germanium is a semiconductor that has superior electronic properties compared to silicon, and is being considered as a replacement for silicon in semiconductor technology. It is also an attractive anode material for lithium-ion batteries because it has a large theoretical charge-discharge capacity compared to graphite and high lithium ion diffusivity at room temperature compared to silicon. The large volume changes associated with charge-discharge processes require anodes be made of high-surface-area nanostructures of germanium. A lack of inexpensive and simple methods to produce germanium nanostructures has so far limited their use in battery electrode applications. Now, researchers at the Missouri University of Science and Technology have shown for the first time that germanium nanowires can be deposited by a simple, one-step process called electrodeposition that could provide a low cost route to fabricate these anodes. The nanowires were grown on an indium tin oxide substrate. An electrochemical reduction produces tiny indium nanoparticles on the indium tin oxide surface, which act as sites for the nucleation and crystallization of germanium nanowires. The nanowire diameter can be controlled by the solution temperature: wires grown at room temperature have an average diameter of 35 nanometers, whereas those grown at 95°C have an average diameter of 100 nanometers. The germanium nanowires produced by this method are highly conductive, because they contain a small amount of indium impurity (~0.2 atomic percent), making them ideal for lithium-ion battery applications.